I'm a disabled veteran. Can I travel with a power or wheelchair? Assuming you are eligible then the normal process for determining Space-A travel is followed. According to DOD4515.13r Para 3.1.b (22 January 2016), all disabled passengers are allowed onto the aircraft and Passenger service personnel and aircraft crewmembers will provide assistance in boarding, seating, and deplaning a disabled passenger. The chief of the passenger travel section or the aircraft CDR may disapprove transportation if there is an unacceptable risk to the safety or health of the disabled passenger, other passengers, or crew, or if operational necessity, equipment, or manpower limitations preclude accepting a disabled passenger, service animal, or mobility assistance device. The aircraft Commander is the final approval authority on all matters relating to flight safety. I'm selected for a flight and the PSA wants to know my "Final Destination." What is this and what do I do? I'm selected for a flight and the PSA wants to know my "Final Destination." What is this and what do I do? Think of the "Final Destination" as the furthest place you want to travel away from the place you are first selected for a flight. For example, let's say you've been signed up at Dover for a long time (55 days for a retired Space-A traveler) and Dover is the only place you have signed up (if you were smart you would have also signed up at all nearby departure points such as Andrews, BWI, McGuire etc.. as well). But, let's say you weren't smart and you just signed up at Dover. You desire transportation to Aviano, Italy so Aviano is going to be your "final destination." The only flights leaving Dover are going to Ramstein AB, Germany. You're selected for the Ramstein flight and during check-in the PSA will ask you for your "final destination." You smile and say "Aviano, Italy please!" If all goes well, the PSA won't even blink and he/she will present you with an AMC Form 148 (aka a Boarding Pass) with "Aviano" listed as your destination (even though the mission you have been selected for is only going as far as Ramstein. Do not leave the Space-A counter unless Aviano is listed on your boarding pass as the destination! If necessary, refer the nice PSA to the Space-A regulations (DoDI 4515.13 Section 4.7.C or Air Mobility Command Instruction 24-101 Vol 14, Para 12.63 that states: "The original date and time of sign-up will be documented and remain with the traveler until movement to their declared final destination is complete, their leave terminates, or a maximum of 60 days has passed, whichever occurs first." Ensure the passenger's final destination is annotated on the boarding pass. If you don't follow the above process then you will arrive at Ramstein and you will have to re-signup for space-a travel from Ramstein to Aviano (in other words your 55-day seniority as a Cat-VI will now be a zero-day seniority!). If you follow the above process then, upon presentation of your boarding pass at Ramstein's Pax desk the PSA "should" register you in their system with the same 55-day signup seniority (probably 56 days now!). Again, if they don't, refer them to the regulations. This process works no matter how many different missions you take or how many locations you pass through (as long as you are "continuing to move to your declared final destination"). In other words, you can't take a week touring Germany (or other locations) enroute. This process has worked for me even going in opposite directions (e.g. "going east to go west"). Once, I had a hard time getting out of Mildenhall, UK to Dover so I took a flight to Germany with "Dover" listed as my "final destination" and then was selected for a flight from Ramstein to Dover based on my Mildenhall date/time group signup (I wasn't signed up at Ramstein). Here's an example of what your boarding pass should look like. In this example, you'll see Dover was mistakenly entered when I departed Mildenhall and I had to have the PAX rep annotate it with the correct "final destination" of Travis so I would retain my signup priority when the mission terminated at Dover. To be safe, ensure the computer system prints your final destination on your boarding pass as written entries may not be accepted everywhere. If you get a Pax Rep who says the system can't print your Final Destination on the boarding pass or it's not allowed then ask for a senior Pax Rep as the system and regs allow it. Knowledge is power. As a general rule, anytime school is out (including the DoDDS Schools overseas) is a BAD time to travel - more so overseas than within CONUS. Why? Because you'll compete with Cat-IIIs taking trips with 3-4 dependents in tow sucking up all the seats. That's not saying a Cat-VI can't get out of places like Dover in the heat of the summer. Timing is everything so it can happen. If you're Cat-V or Cat-VI it's going to be harder for you to get seats during DoD school breaks and even a few weeks prior and after the scheduled breaks. 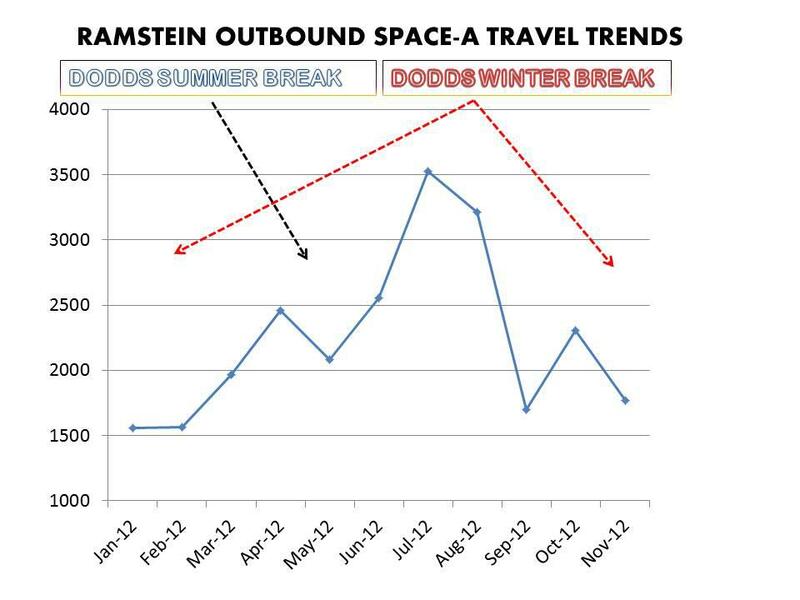 If you need some proof then take a look at Ramstein's passenger movement for 2012. Notice the spikes in traffic that correlate with Summer and Winter school breaks? If you're Cat-III then you've got as good a chance as everyone else. If you're not tied to school breaks then it would be best to travel "off peak" to maximize "your chances." Finally, don't forget about lodging availability. Some bases have an active Guard/Reserve unit and therefore you should try to avoid "drill weekends." When the Guard/Reserve personnel come on base to train, accommodations are often completely booked! A simple call to the base lodging reservation desk would help you identify the best timing for lodging availability. For current and future DoDDS calendars see the DoDEA School Calendar link listed in the "Newbie" section at the start of the FAQ. Keep in mind that many families may take their kids out of school earlier than the last day of school and return after the first day of school so take the calendar dates with a grain of salt. What are my chances of getting seats on a particular flight and how long will I have to wait? This is probably the #1 question asked by folks new to Space-A. Your specific"chances" depend on two key variables: the number of available seats versus the number of folks competing for available seats on a particular flight. Those two key variables are not known until "the "roll call" so anybody that predicts one's specific"chances" in advance is only guessing. The only prediction of "chances" one can make is your relative "chances." A higher Category traveler (e.g. Cat-I) has better "chances" than a lower Category (e.g. Cat-VI) and the longer you are signed up gives you better "chances" than someone signed up less days within your Category. Your chances are Zero if you are not "travel ready" at the terminal. Your chances are Zero if you are spending down-time between "scheduled" flights at home, billeting, the BX, Burger King, library, bowling alley or some other location. Your chances increase when kids are in school versus when kids are out of school and traveling with their families. Your chances increase if you are "travel ready" at the terminal and wait for a flight. Your chances are better if you travel light (baggage under 30 lbs) as it makes you eligible for ALL types of aircraft. Your chances will improve the more you know the rules, methods and timing of sign-up, perseverance, patience and timing or travel. Bottom line, the best chances of a Space-A seat is to ensure you are in the Terminal BEFORE (I recommend an hour) the posted Roll Call time and hang around the Terminal until the Aircraft departs (as seats can change at any time). What is the "Best" Location to get a flight from "A" to "B"? The "BEST" Location is the one that will have the most Space-A seats available to your desired destination and the least amount of fellow passengers competing for those seats on the day you attempt to travel. Unfortunately, that's virtually impossible to predict in advance. The "best" route also depends on your Space-A Category as there may be CONUS limitations if you are an unaccompanied dependent. The "best" route "usually" is from a location that has frequent flights to a destination (e.g. BWI or Dover to Germany) however, since it has frequent flights then you will "usually" find lots of folks competing for those seats from that location. One day, the "best" route to Europe may be from BWI to Ramstein and the next day it could be from McGuire to Spangdahlem or Andrews to Ramstein. "Best" may also involve a departure location that has free parking and is easy to return to to pickup your car. You can check the resources available at www.spacea.net/faq/routes to help you decide which is best for you. Can I travel Space-A to Australia or New Zealand? Australia Option 1: There are typically 4 flights per month (As of March 2015) from Travis AFB through Hickam, Hawaii and sometimes Andersen, Guam to RAAF Base Richmond (near Sydney). Occasionally, flights return to the US from Richmond via Christchurch, NZ. Normally, these flights have few seats available, so while possible, it is difficult to get on the run to Richmond; however, returning from Richmond to the USA is often easier. Australia Option 2: Space-A to Yokota and then Space-A to Singapore (3 weekly) and then use commercial air from Singapore to Darwin (about $100 or less one way) or Perth (about $200 one way). Australia Option 3: Space-A to Hawaii and then check fares on JETSTAR Airlines from Honolulu to Sydney (just under $400 one way). NOTE: All foreigners entering Australia are required to obtain visas Australia Electronic Travel Authority (ETA). In addition, upon leaving Australia you must pay $55 AUD cash (as of March 2015) to its Customs and Border agents. New Zealand: Space-A to Hawaii and then try for a "rare" mission to Christchurch or try commercial from Australia. What's the policy on making unused Passenger Seats available for Space-A? According to the Defense Travel Reg, "Unused passenger space on DoD-owned and controlled passenger-carrying aircraft, on all types of missions (e.g., channel, SAAM, Operational Support Airlift (OSA), Aeromedical Evacuation) be utilized to the maximum extent possible, to include Space Available (Space-A) passengers, as authorized by DODI 4515.13. Available seats will be released for Space-A travel unless overriding safety or legal concerns (including hazardous cargo, CBP, agriculture, or immigration considerations), or a defined need for security prohibit Space-A travelers from flying on a specific mission." (DTR Part I, Passenger Movement, Chapter 103). The DoD Policy is reiterated in AMCI 24-101 V14, Para 4.9.2., "IAW DoD policy, all unused seats on DoD-owned or controlled airlift will be released for use by Space-R and SpaceA passengers. On all mission types, the senior AMC or terminal representative, in coordination with the aircraft commander and the user as applicable, will determine if a defined need for security, or if overriding safety or legal concerns (including hazardous cargo, customs, agriculture or citizenship and immigration service consideration) prohibits Space-A travelers from flying on a specific mission. The aircraft commander is the final authority responsible for all matters affecting the operation of their aircraft. This authority is to be exercised judiciously within the context of DoD Space-A policy stated in Para 10.2. Situations where the above prohibitions restrict Space-A travelers from a particular mission should be the rare exception rather than the rule." Can I fly Space-A to Shannon Ireland? Some flights do stop in Shannon en route to/from Europe but sometimes you may not be allowed to deplane (except for a secure part of the terminal for in-transit passengers) - depends on the mission. Some passengers on USN flights have had some luck manifesting to Shannon (but it's rare). If the flight is going to RON at Shannon then Crew and Pax will have to clear Republic of Ireland's Immigration and Customs. Getting a flight from Shannon would be fairly difficult. Can I travel Space-A on the same plane with my sponsor when he/she is going TDY? If you are eligible for command or non-command sponsored status then you can "try" to get a seat on the same flight your sponsor is booked on but there are no guarantees. You are on your own as an unaccompanied dependent and you must abide by all the rules for unaccompanied dependent travel. You may get to your sponsor's TDY destination on the same plane but there's no guarantee you'll return on the same plane as your sponsor (i.e. you may get stranded at the TDY location). What is a SOFA and how can it affect me? SOFA stands for Status of Forces Agreement. A status of forces agreement (SOFA) is an agreement between a host country (e.g. Germany, Italy, Japan) and a foreign nation (e.g. USA) stationing forces (military, civilian and contractor..) in that country. SOFAs are often included, along with other types of military agreements, as part of a comprehensive security arrangement. A SOFA does not constitute a security arrangement; it establishes the rights and privileges of foreign personnel present in a host country in support of the larger security arrangement. Sometimes a SOFA stamp is placed in person's passport. It's a document or stamp in your passport that shows you are stationed in a country and covered by the Status of Forces Agreement. The SOFA stamp registers the person and identifies them as having protections and rights under our SOFA agreement. The SOFA may cover issues like entry and exit into the country, tax liabilities, postal services, or employment terms for host-country nationals, but the most contentious issues are civil and criminal jurisdiction over bases and personnel. Some SOFAs may govern entry procedures into a country when traveling Space-A (e.g. non SOFA personnel arriving at Misawa, Japan have to turn in their passport to the security forces and are not allowed to leave the base until the custom officer comes to Misawa to stamp your passport (possibly the following duty day). My sponsor is TDY. Can I travel Space-A to visit my sponsor at his/her TDY location or rendezvous with them at some other location? Sorry, no (unless your travel is authorized under command sponsorship eligibility). I have an emergency and need to get somewhere quick. What are my options? Per DoDI 1327.06 (Leave and Liberty Policy and Procedures), Emergency Leave is intended for "Immediate Family" which is defined as "A Service member’s parents, persons who have stood in "Loco Parentis", siblings, children, and the spouse’s parents and siblings." "Loco Parentis" is Latin for "in the place of a parent" and refers to the legal responsibility of a person to take on some of the functions and responsibilities of a parent (i.e. the person provided for your physical and financial well being as a child). Grandparents don't qualify as "immediate family" unless they raised you instead of a parent. It helps if the "Loco Parentis" individual is already documented in DEERS. What is the significance of references to a "Red Bandanna"? Some Space-A passengers will wear or tie a red bandanna to their carry-on luggage to signify that they participate in the pepperd.com message board. There's no guarantee that someone displaying a red bandanna is a fellow internet Space-A "expert" but you'll never know unless you approach them and introduce yourself! Space-A Myths: "Someone (or a friend) told me that..."
Do yourself a favor and don't take any Space-A advice from the above folks (friends) that told you any of the above!! One more question - How do I ---? To most people, Space-A travel ranks right up there with Public Speaking - everyone is afraid of doing it the first time. Much of this fear comes from lack of knowledge and the unpredictability of flights. The more you learn about Space-A travel the less fear you will have. Learn as much as you can from the SpaceA.net FAQ, Pages and associated links. I guarantee that 95% of the questions can be answered from those sources (yes, I know, it's easier to ask it on the Space-A Message Forums but you'll learn more doing your own research). I can't speak for everyone but I learned by reading the regs, one of the available books and the by "Doing It" (the Internet, E-mail and the Space-A Message Boards didn't exist when I started)! Actually doing a Space-A trip is the real teacher and don't be surprised if you learn some hard lessons your first time out! On the other hand, your first experience may be a pleasant one where everything goes as planned. In that respect "Space-A is like a box of chocolates or like going to Las Vegas and can be a gamble - you never know what you're going to get!" I'd recommend taking a "dry-run" trip or if you're near a PAX terminal go visit and hang out for a day and talk to some of the folks waiting for flights. If you are a "planner" then you may find Space-A overwhelming and stressful. If you like having that warm, comfortable, safe feeling of knowing where you going, when you'll get there, and how much it'll cost, you need to AVOID Space-A. If you enjoy pushing all of your chips on the table and waiting to see what card the dealer turns, then you'll love it. But be warned, a bad days waiting for seats can be expensive and use up valuable leave time. Following the tips in this FAQ and experiencing the Space-A environment by visiting a Pax terminal will help to reduce some of the apprehension you may have! Good Luck and see you in the terminal! !